Saturday 30th April- We have a pass!!!!!!!!!! With the MOT booked for 11.30 I had time to sort out one or two last minute jobs. First job was to put some 'Wynns Stop Leak' fluid into the power steering reservoir and the second was to give the car a damn good wash. I also suddenly realised that although I have owned this car since last summer, I have never really driven it far enough to get above second gear! A few laps round the local industrial estate soon fixed this and also revealed that it has a grumbling noise at around 60mph.....Err...I mean 30mph, (I always stick to the speed limits!) and also that when the overdrive on the gear stick engages, it sends 12 volts up through my left arm rather than down to the gearbox! Neither of these are MOT failures though, so I wasn't that concerned. Friday April 29th. Got my baby back! Today saw the collection of the Rally car after having some paint put on it. It was starting to look really grubby and recent sill repairs had left it a few different colours, so it needed a bit of tidying up. It's not an absolutely perfect job, but then for what it cost me, I never expected it to be. It looks presentable again though, which was the main aim, so I'm happy! Thursday 28th April- Bleeding Brakes!!! I haven't had time to repair or replace the steering rack, so a can of Wynn's 'Power steering stop leak' will hopefully do what it says on the tin, and on a wing and prayer, we should be ok. The only other thing I need to do is....sort out my bloody sleep pattern! I've had insomnia for years now, and it seems to be getting worse. If you look at the pic above, the eagle eyed amongst you will have noticed that the clock on the wall says quarter past two, but the garage door is open and its dark outside, meaning.......yes that its 2.15 AM!!!!!!! The first chore of the day today was to load the estate up with a load of old crap from the loft and run it down to the tip. I took some tools with me as the estate has recently gone back to its issue of a year ago. I.e. the fuel line blocking up again. It's not too much of an issue, just bloody annoying. Everytime it happens, I have to undo the fuel line under the bonnet and blow down it until it clears the obstruction! I have another load of old crap to run down to the tip tomorrow, so it'll be another good test for it. And if it breaks down, I can leave the bloody thing there! With the tank now fitted the car was now drivable again and I turned it round so I could do a bit more prepwork on the drivers side ready for the new paint. It was a bit of a challenge reversing it in and out of the garage and garden gates with no mirrors on it, but the manoeuvre was completed successfully without causing damage to next doors walls or injuries to a neighbours cat! April 22nd. Good Friday or Bad Friday???? An additional day off due to Easter saw work commence on the Rally Car. The Scottish Highlands Rally is less than two months away and I need to replace a rusty door and a leaking petrol tank! The replacement door to be fitted was completely bare, so all of the components and trim from the original door needed transferring. The replacement door is also the wrong colour, but the car will be going for spraying next weekend so its not an issue. In readiness of the aforementioned painting, I removed some of the other trim as well. The removal of the petrol tank was a bit more of a hassle, mainly because there still over half a tankful in it! Siphoning some of it out made it light enough to lift the tank out and also left the estate nearly full! As soon as I removed the rear cover where the tank is, there was evidence that it had definitely been leaking. ﻿While the weather was hot and the sun was shining I decided to give the estate a good wash and hoover out. I also repaired the off side rear door, (which wouldn't lock) and changed the battery and fitted the proper battery clamps. 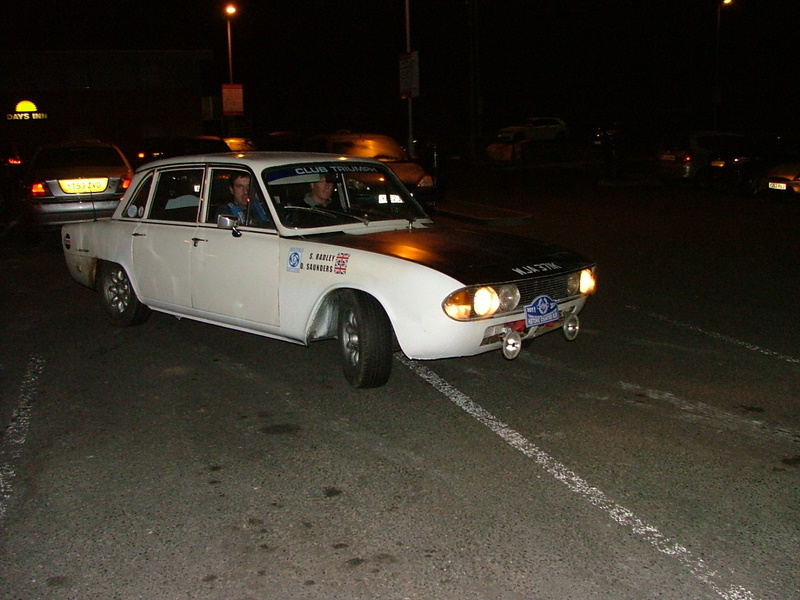 This car went to Carlow Engineering during the week and had its carburettors tuned and balanced. I have to say, they did a fantastic job for a very good price and I was very impressed. So much so that I will be sending the Rally car there for a tune up before the Scottish rally too! 16th & 17th April. A busy time for all three cars! The time has come to start preparing the Rally car for a bit of paint work. The body shop can take the car in anytime over the next two long weekends, so the rush is now on to get the car prepped and a decent door fitted on the nearside front. (you can see how bad the rust is from the above pic!) As you can see the work has already started and now that she is minus her stickers, she looks almost naked! I also discovered a leaking petrol tank, so a trip up to Cambridgeshire next weekend will see collection of a replacement. The estate car is behaving itself at present although it still needs to have it's twin SU carbs tuned. It's being taken to Carlow Engineering at Benfleet tomorrow evening for this task to be performed, but before it went over there I wanted to remove the petrol tank and flush it out. About four hours later, the car was all back together complete with flushed petrol tank. Hopefully I wont have to touch this area of the car for a long while now. I haven't got the time at the moment! After trial fitting the roll cage to the Mk1 last weekend, I've now decided to remove it altogether. With the roll cage in it became evident that I wouldn't have the use of sunvisors, front window winder handles (not without opening the door first anyway!) rear seats, carpets, and I would have to climb over the side bar every time I wanted to get in or out! If this was going to be an occasional track car and nothing else, then it wouldn't have been so bad, but this will eventually be a long distance cruiser and comfort will be a key factor. So, I'm currently refitting the interior. (I need black carpet!) I also have to take a trip over to Mayland later this week to pick up some BMW 3 series seats to try out in it. Now that will be nice if they fit! The silver floor panels you can see are covered in protective Hammerite paint. Black would have been better, but I had ran out and was just too damn lazy to go out and get some more. The carpet will be over it anyway so it matters not! Sunday April 10th-Trial fitting the roll cage! The trial fitting of the roll cage to 'Yellow' was, to say the least, a testing experience! The idea was, to fit it, ensure it was the right cage for the car, remove it again, then paint it, then refit it. To do this, the entire interior needed to be removed, including the carpets and the seat belts. After three hours of removing the interior, putting two holes in the headlining, cracking the dashboard and sweating about three gallons of best salt water, it was in. April 2nd-3rd. 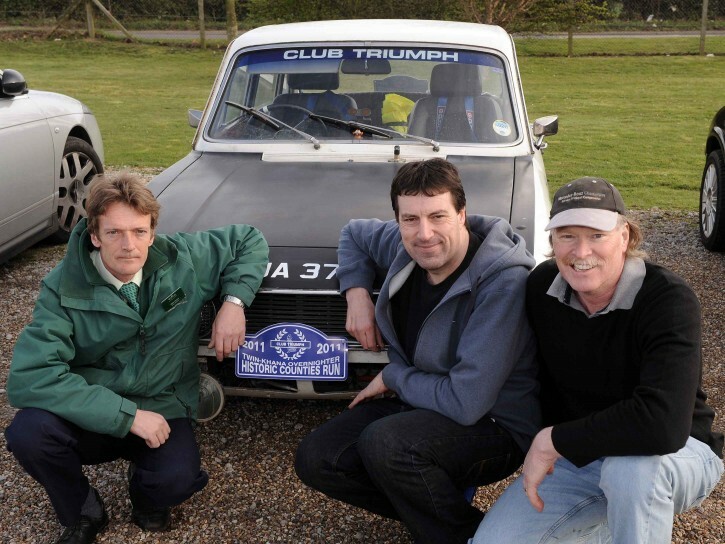 Club Triumph Historic Counties Rally. This weekend saw the annual running of the CT Historic Counties Rally. This is a 'Scatter Rally' where various counties and points of interest have to be passed through to gain points. (and photographic evidence has to be provided!) I was determined to complete it this year as last year issues regarding vehicle breakdowns and severe lack of sleep saw us retiring half way through the second part due to sheer knackeredness! Regular co-driver, navigator, farting rival and long term bestest mate Dave Saunders wasn't available, so fellow Triumph estate lover Peter Jackson was my company for this one. After leaving my house in Essex, I picked Peter up from Cambridgeshire and we then made the long trek up to the start at Barnoldswick in Lancashire. The rally started at 6pm with a speed test around some traffic cones and I got off to a flying start by getting the big saloon sideways big time (and almost losing it big time!) and unfortunately hitting two cones! (two lost points!) We then started to plot our route which took us into West Yorkshire, North Yorkshire, South Yorkshire, Derbyshire, Staffordshire and finally the halfway point at 1.30am Sunday Morning in Shropshire. The second half saw us head into the county of Powys, (Mid wales) and avoiding the teenage binge drinkers falling all over the road in Welshpool provided some good entertainment as well! We then headed back towards Birmingham only to find the M6 closed and so had to divert through Wolverhampton where we picked up the M5, then M42 & M40. The counties of Oxfordshire, and Buckinghamshire were collected on the M40 while Hertfordshire and Essex was collected on the M25. The final county of Suffolk was gained on the A12 up to the finishing location in Woodbridge at around 10am. Luckily, Peter's wife drive down to Ipswich to take him off my hands, so I was able to make the short journey back to my house where I promptly had a shower and then fell asleep on the sofa for three hours! (Not sleeping the night before does that to you!) Once again the Rally car performed absolutely flawlessly and was a pleasure to drive. Roll on the Scottish highlands rally in 9 weeks time! The Wyevale Garden Centre publicity pic. This is because we were the first team to arrive in Suffolk.